Finished bag measures approximately 17cm (6 4/5 inches) wide by 33cm (13 1/5 inches) high (not including strap). Work another 6 rows linen st without decreasing. Cast on 41 sts, work 31.5cm (12 3/5 inches) linen st.
Line up the cast on edges of the front and back and sew the sides and bottom together using a neat running st.
Make another length of I-cord long enough to go around the bottom and up both sides of the bag, plus 51cm (20 inches) long for strap. Sew the I-cord around the flap of the bag using a couching st (see image above), making sure that it does not bunch up and cause the edges to ruffle. If your cord is too long simply undo the extra rows and fasten off yarn securely as before. Measure the longer piece of cord and mark the centre with a piece of contrasting yarn. 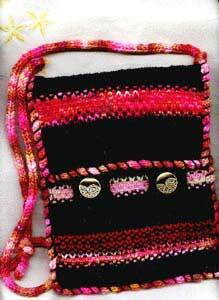 Matching this thread to the centre bottom of the bag, sew the cord to the sides and bottom in the same manner as you did for the flap. Tie a knot in the I-cord just above the flap on either side for a neat finish, tie the ends of the cord together to form the strap. Cast on 9 sts and knit 16 rows. Knit 9 rows, cast off. Sew button bands in place on the wrong side of the flap, just above the I-cord edging. Pattern and images Copyright © Sarah Bradberry February 1st 1998. All rights reserved.